Why do his colleages, people who host talk shows several hours each day, then go home and blog? Blogging lets them let their hair down and say things they either can't say or don't have the opportunity to say during their workday. A similar question could be asked of me: "Since you work with blogs all day long, why do you go home at night and blog about food?" The answer is that I love cooking and Fumbling Foodie gives me an outlet to talk about it. I suspect that blogging gives them a chance to feel part of a community; part of something bigger than just themelves. Fumbling Foodie is part of a community that spans the globe. I have foodie friends all over the world and we stay connected to each other through our blogs. I suspect that sense of connection and community is something they don't get hosting a talk show. This was, BTW, my first television appearance. I was nervous as all get-out. My son watched my 'performance' on his TV and said something I thought was interesting: "When I got this TV I never thought I would see my Dad on it." In general, the average business person does not spend enough time working on things that will build their reputation, exposure and image. They don't spend enough time reaching out and staying connected to their most loyal customers and building relationships with new ones. 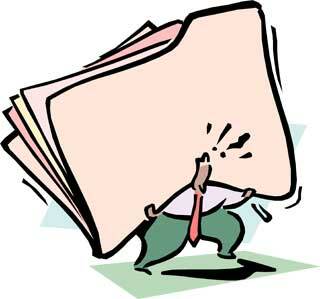 And this is irrespective of whether or not these activities are done via blogging. In truth, blogging can consume huge amounts of time, or almost no time at all (If you have time to write one extra email each week then you have time to write a blog post each week). And - crass commercial plug - we are in the business of making blogging as easy for you as possible. Even one blog post helps. Consider time spent blogging as an investment: If you put a lot in quickly, then it pays off quicky. If you invest more slowly and in smaller amounts, it still pays off: it just takes longer and the payoff isn't as big. I've lost track of the number of times I've woken up the morning after a networking event to find half a dozen new unsolicited newsletters in my inbox. Handing someone my business card does not - in my mind - constitute my permission to add me to their newsletter mailing list. I publish a newsletter - and I have vowed that starting next month I'll publish it on a regular schedule. I may even ask you if I can put you on the mailing list. I won't do so just because we met once at a networking event. Seth Goden talks about Permission Marketing: Getting your permission to martket to you. I am a firm believer in that. Blogs are permission marketing. You are reading my blog or it's RSS feed because you want to, not because I've decided it is time to remind you that I exist. Furthermore, you are reading my blog at a time and place that is convienient for you. While I view email as an interruption, I realize that you may not. Some people like email a lot, and for those people, I've made it easy to subscribe to this blog via emal. I've also noticed that there is almost no overlap between my blog's RSS readership and my newsletter readership, so I am reluctant to drop the newsletter at this point. So I'm keeping my newsletter for the time being, but I won't subscribe you to it without your permission. 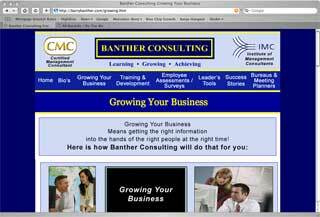 Business Blogging Pros welcoms Banther Consulting as our newest client. I look forward to reading Barry's blog. 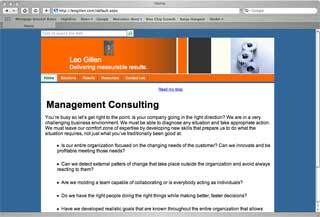 Business Blogging Pros welcomes Leo Gillen Consulting as our newest client. I met Leo at CONFAB last week. As Leo says, the world is changing at warp speed. Our markets, economies, and business enviroments are changing, and the pace of change is continually accelerating. Leo helps companies not only cope with these changes, but to actually thrive upon them and leverage them. Leo has a lot of interesting, thought-provoking ideas and it will be fun to learn from him via his blog.